يقع منتجع شيراتون لاجونا جوام في منطقة مشهورة للغاية في المدينة. هذا الفندق هو من الخيارات الشائع بين المسافرين. يقع الفندق على بعد 3.1 Km من مركز المدينة، ويؤمن الوصول إلى أهم مراكز المدينة. إن سهولة الوصول من الفندق إلى المعالم السياحية الشهيرة الكثيرة في المدينة هو استثنائي بحد ذاته. إن منتجع شيراتون لاجونا جوام حريص على توفير الراحة للنزلاء، فلا يوفر الموظفون جهداً في تقديم أفضل الخدمات وضمان حسن الاستقبال. تتضمن الميزات الرئيسية في هذا الفندق: خدمة الغرف على مدار الساعة, واي فاي مجاني في جميع الغرف, مكتب الاستقبال على مدار الساعة, مرافق مخصصة لذوي الاحتياجات الخاصة, تخزين الأمتعة. تتضمن كل غرف النزلاء وسائل الراحة والتسلية المصممة خصيصاً لضمان الراحة القصوى للضيوف. كما أن مجموعة الخدمات الواسعة الموجودة في الفندق لضمان راحتك تترك لك الكثير من الخيارات لقضاء وقتك أثناء فترة إقامتك. إن منتجع شيراتون لاجونا جوام هو خيار ذكي بالنسبة للمسافرين، فهو يوفر إقامة هادئة ومناسبة للاسترخاء. The Hotel facilities were a bit aged and in need of a renewal, but everything was functional in the hotel room. The hotel didn't have a beach area like the Westin, so we kept close to the hotel's infinity pool when going swimming. We purchased the buffet breakfast as a package with the room and the breakfast variety and quality of food was a definite 7/10. The cleaning staff must have been new as they forgot to clean one day (out of 5). The gym floor was not cleaned throughout our staff as there were food droppings beside the edge of the floor that remained there for the entire stay. As well as the gym floor and yoga mats were a tad on the sticky side. Its an ok place and I would not "not recommend it" but there are nicer hotels in Guam. It wasn't bad, but it's not the best value of money. The resort is farely old, but has amazing pool where you can relax and have fun with friends or family. Due to distance from city center, it's better to rent a car or use shuttle service. I really enjoyed my stay here! The location was a wee inconvenient, but they make up with a few transportation options. The staff was superb. Very accommodating!! Their attitude made me feel they were really happy to provide service! Thank you Sheraton Guam!! there is electricity problem in our room, we can't use the hairdryer and the pot at the same time. anyway, the room is nice, also highly recommend to join the yoga class in the morning. It's amazing and comfortable to do yoga with the sea wind, bird's singing and blue sky. far distance from the city, must rent an own transport for convenience. However, it is an ideal place to stay if you looking for privacy. Shortage of manpower at front desk, looking for improvement to expedite the check-in process. Location is not too convenient. Not close to the bar and restaurant areas. The room was not bad, nice pool and sea view. The infinity pool and family pool were the best!!! Nice view and got a long water slide, which was super fun. Although it's a hotel that has traces of getting old, Sheraton Laguna still maintains its old glory and class. The room where we stayed has a great ocean view and scent of luxury. and comfort. I enjoyed it. We had a great time staying at Sheraton. Food, Value for Money, Nice room, Nice pool, friendly staff. I rate all that I listed a 5. The only 4 rating would be the location. 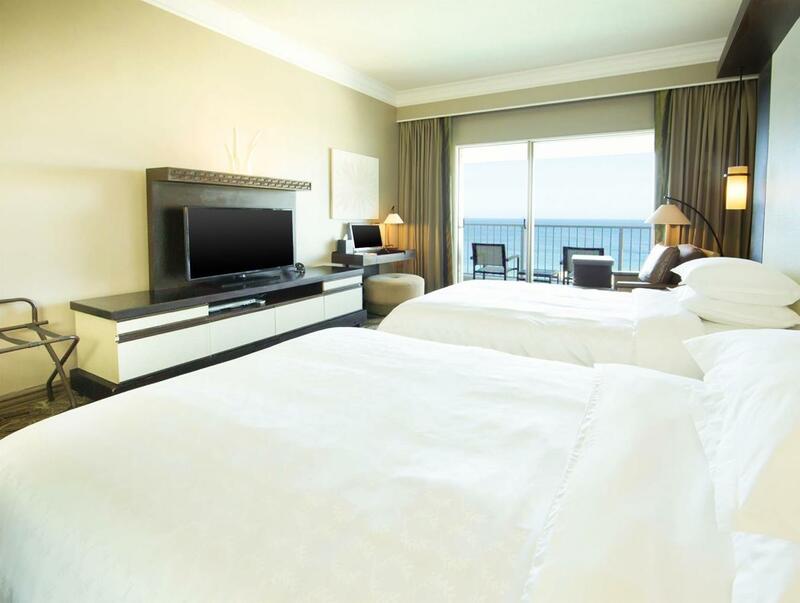 Your would have to drive or take a short bus trip to Tumon where most other hotels are located. As you know, the infinity pool was really gorgeous! It was so far from the main street, so we need to rent a car. I reserved ocean front corner sweet room, and it was so nice. The only thing was I disappointed, I request them for changing the twin beds to double bed. But they just sum two beds. Sheraton is always my favorite!! after staying 2 days at PIC with all the families & kids running around. Me and my friend decided to moved to Sheraton. Nicer room, more spaces for adults like bars, pools, restaurants. Rented a car before canceling hotel I didn’t like, visit few 5 star hotels, price/quality it was the best. Nice infinity pool, like the high interior space between two corpuses. Very nice view from my room. I found very strange thing all hotels not very clean, my local friend said Philippine maids are very lazy and low paid. One hotel was quiet clean but 38 percent expensive, and pools I like more in that hotel. I wish managers pay more attention and clean rooms corridors better it would be much comfortable. One thing, if you need to work with computer better take one with you, business center is big but comps and soft are bad no wifi in the room, cable. Overall feeling was very satisfied. I genuinely hate to be a hater but this was a really tedious travel experience. Booked this late to be near the airport and do a little shopping before heading home. Room not ready at checking in time 3pm, after waiting a long time at reception (30mins) where the staff were dealing with other traveler issues. Tried to recheck in at 9pm that night, had to wait in a queue for 45 mins that time while staff were dealing with other issues (! ), ordered room service as missed the restaurants because of waiting, freezing food, delivered without bottle opener. Check out bill was incorrect, had to wait again (this time only 10 mins). Then my airport transfer was 15 mins late and only arrived when I was incredibly angry. Hotel was run down and shabby looking, it’s generous to give it 3 stars. It's worthy hotel in Guam. No greetings was offered when I arrived at the hotel counter. Even the hotel couldn't offer early check-in service, the staff could express the message more politely. When I wanted to order a drink in the lobby lounge, the waiter just said "he'll be back" but I waited for around 20 mins with no trace of the staff again. I was so desperate and left the lounge. The drink voucher offered by the hotel could be used in a few places with limited drinks. The toilet of the pool in the hotel was also very poor. The toilet bowl was almost damaged. The location is not convenient. One need to take the bus or wait for the free DFS shuttle bus if one wants to go to Tumon. If you rent a car, then it is OK. Overall, the facilities were old though they looked nice in the photos. Also, the service of a four-star international-brand hotel needs to be greatly improved. Although it's location is away from the main beach, I truly enjoyed my honeymoon stay here. Room condition was excellent and also the lounge bar was good enough. Infinity pool was below my expectation. I strongly recommend this hotel to couples who can rent a car. A bit old but still a pleasant stay with good ocean view and hotel facilities. Only that it was quite distant from the main tumon beach and only had a one way tram operating, but still most of the svc was convenient. Great hotel with young children. It has some stuff, such as tennis court, Kayak, pool slide, infinite pool, BBQ party with sunset, and nice Japanese restaurant. The only thing I did not like was the poor fitness center. It needs to be refurnished with nice stuff. Nice place to relax. While the hotel is not near the shopping and restaurants in Tumon, the location is quiet and restful. The view is spectacular and was perfect for relaxing and getting away. Wonderful pool with slide for the kids and a separate pool with spa for the adults.